When you're preparing to party, naturally you need to make sure there's enough beer. And what's worse than grabbing a bunch of different six-packs and trying to accommodate everyone's annoying snobby beer palate? The dudes at Austin Beerworks have considered your feelings and made it easy for you. 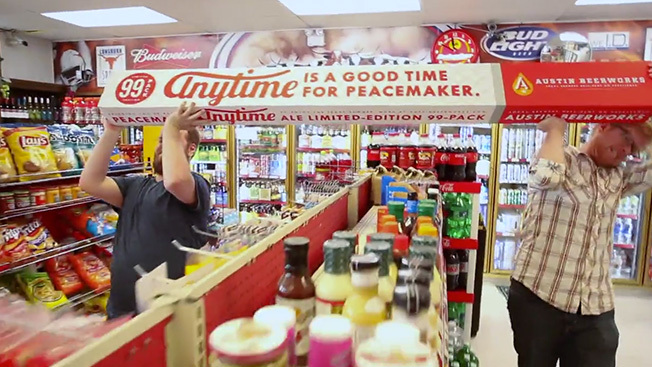 They've introduced Peacemaker Anytime Ale, which they describe as a "sessionable" beer (meant to drink over a long period of time, anytime) and have packaged it in the world's first 99-pack of beer. Yes, this miracle of beer actually exists. From the website: "It's not only real, it's an amazing deal: ninety-nine beers for $99. That’s 82 pounds of craft beer! Over seven feet of crisp, flavorful Peacemaker!" Find out if it's available in your area on the website and using the #AnytimeAle hashtag. And take a look at the promo video below. I'll be reconsidering my religious beliefs, as my prayers were just answered.